We spend a shocking 43 percent of our day doing things without thinking about them. That means that almost half of our actions aren’t conscious choices but the result of our non-conscious mind nudging our body to act along learned behaviors. How we respond to the people around us; the way we conduct ourselves in a meeting; what we buy; when and how we exercise, eat, and drink—a truly remarkable number of things we do every day, regardless of their complexity, operate outside of our awareness. We do them automatically. We do them by habit. And yet, whenever we want to change something about ourselves, we rely on willpower. We keep turning to our conscious selves, hoping that our determination and intention will be enough to effect positive change. And that is why almost all of us fail. But what if you could harness the extraordinary power of your unconscious mind, which already determines so much of what you do, to truly reach your goals? 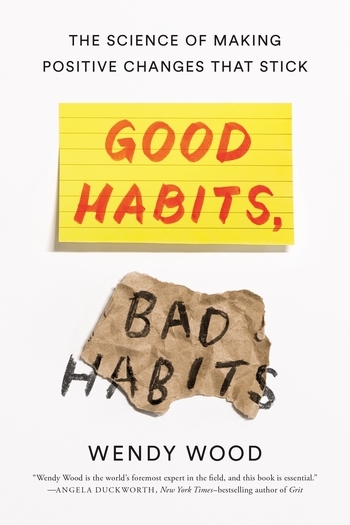 Wendy Wood draws on three decades of original research to explain the fascinating science of how we form habits, and offers the key to unlocking our habitual mind in order to make the changes we seek. A potent mix of neuroscience, case studies, and experiments conducted in her lab, Good Habits, Bad Habits is a comprehensive, accessible, and above all deeply practical book that will change the way you think about almost every aspect of your life. By explaining how our brains are wired to respond to rewards, receive cues from our surroundings, and shut down when faced with too much friction, Wood skillfully dissects habit formation, demonstrating how we can take advantage of this knowledge to form better habits. Her clear and incisive work shows why willpower alone is woefully inadequate when we’re working toward building the life we truly want, and offers real hope for those who want to make positive change. Wendy Wood is Provost Professor of Psychology and Business at the University of Southern California. She has written for The Washington Post and the Los Angeles Times, and her work has been featured in The New York Times, the Chicago Tribune, Time magazine, and USA Today, and on NPR. She lectures widely and recently launched the website GoodHabitsBadHabits.org to convey scientific insight on habit to the general public.